We currently field Mens Open and Womens Open teams. 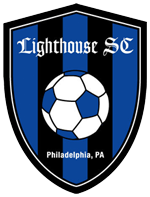 The teams, initially made up of a core group of players who previously played at local Philadelphia soccer clubs and area schools, are both known as Lighthouse United. The teams compete in the Inter-County Soccer League, and games will be played on Sundays beginning Labor Day Weekend and ending Memorial Day Weekend. For more information, contact the team directly at united@lighthousesoccerclub.org.